Who wouldn't want to receive a bouquet of these rose lollipops? These beautiful rose-shaped candies are delicately scented with the fresh floral fragrance of rose water, and they make a perfect gift for Valentine's Day, an anniversary, or any romantic occasion. Prepare your molds by spraying them with a very light coating of nonstick cooking spray and inserting lollipop sticks into the molds. Allow to boil, without stirring, until candy reaches 295 F.
Once the candy reaches 295 F, remove it from the heat. Allow it to sit until it stops bubbling completely. Add the rose water and pink food coloring, and stir until they are evenly dispersed. If you want to make multiple colors from the same batch, start with a light pink color. Pour some of the candy into the mold's cavities. Then add a little more food coloring to deepen the color. Continue until you have made as many shades of red and pink as you desire. Continue to fill the mold's cavities until you run out of candy, making sure that the back of the lollipop sticks are well-embedded in the candy. Allow the lollipops to cool completely at room temperature. Once cool, gently flex the mold to pop them out—do not pull them out by the sticks. Rose water is a common ingredient in Middle Eastern cuisine, and can often be found in the ethnic section of large supermarkets. Rose flavoring or food-grade rose oil can be substituted. Be aware that rose oil is much stronger, so use much less than the recipe calls for—a few drops should probably do it. 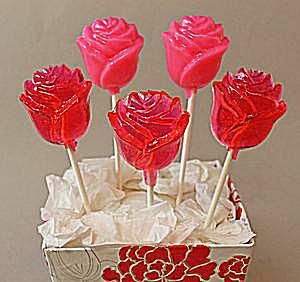 To make opaque lollipops, add a drop or two of white food coloring when you add the pink or red. Store rose lollipops individually wrapped, in an airtight container at room temperature, for up to a month.